Keene Chrysler Dodge Jeep Ram is now offering the AEV turn-key packages for the Wrangler, and Ram Trucks. AEV represent the pinnacle of engineering and unparalleled design. Contact us today to build your own!! What Year and Model Jeep do you have? What Performance Level Are you Looking For? What Else Should We Know to Make Your Vehicle Perfect? An AEV Jeep is perhaps the most capable, dependable, and versatile off-road vehicle on the market. Just ask Keene CDJR, a proud supplier of AEV packages and pre-modded AEV Jeeps. These AEV JK200, JK250, and JK350 Wrangler packages consist of some of the best Wrangler modifications out there. While the JK200 isn’t nearly as performance enhancing as the more popular 250 or 350 packages, it’s still a good entry level option for those looking for minoimprovements. When the 250 or 350 packages are equipped onto a Wrangler, there is nothing that can stop it – not even highway travel. The ability to conquer even the toughest challenges is only one of the reasons to buy an AEV Jeep Wrangler, and there are plenty more. But before we explore why AEV Jeeps are such great all-around vehicles, let’s take a closer look at the packages that make the Wrangler a force to be reckoned with. The off-road ready AEV Wranglers we sell have three different packages: the JK200, JK250, and JK350. Each of these packages add on more equipment than the last, therefore increasing the capability and utility of the Wrangler the higher in package number you go. The JK200 is a great entry level package. It’s the most affordable of the three, and doesn’t add a lot of mods onto the Wrangler. Therefore, it’s perfect for beginners who are looking for an entry level package with some basic off-road gear. IPF 901 off-road lights are included, along with an AEV front/rear bumper, badging, instrument cluster, logo headrest, and non-winch cover plate. While those are a lot of aesthetic changes, this package also comes with a 2.0″ spacer lift, which allows for the installation of 33″ all-terrain tires. 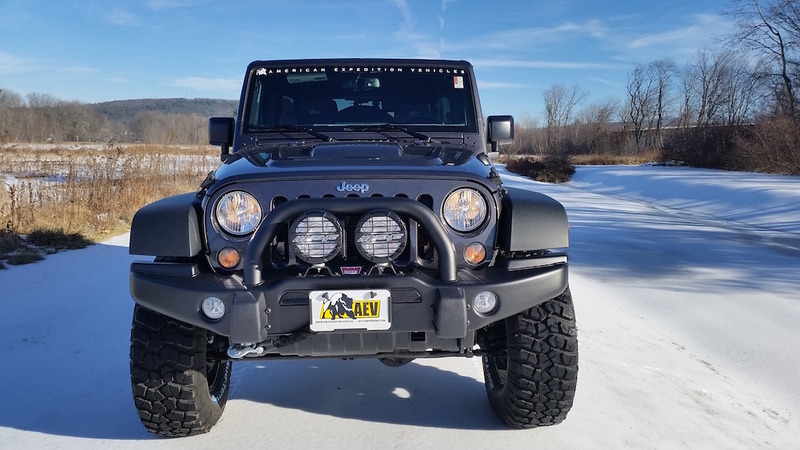 The spacer lift and all-terrain tires provide the Wrangler equipped with the JK200 package a slight advantage in ground clearance over a stock one, which is great for basic off-roading. Anything more than that, and you’ll need to upgrade to one of the beefier packages. In this package, the badging, bumpers, non-winch cover plate, and other AEV aesthetic changes all carry over. But, the 250 package marks the level that mechanical components start getting upgraded. Brakes, shocks, sub cases, etc. Perhaps the biggest advantage the Wrangler benefits from is the 2.5″ DualSport XT Suspension. This suspension allows the equipment of 35″ tires, which provides the Wrangler with some serious ground clearance. More than that, it upgrades the ride quality both on and off the road (more on that later). For those looking to climb and crawl over anything and everything with the Wrangler, a JK350 package should do the trick. This takes everything from the last two packages, and adds on a winch mount with a WARN winch, heat reduction hood, 37″ tires, and a 3.5″ DualSport SC Suspension. The heat reduction hood helps keep things cool under the engine, and the WARN winch and winch mount is a must have for the serious off-roader. Every experienced off-roader knows the value of a good winch, since sometimes it’s the only way to get your Jeep or your friend’s rig unstuck. The 3.5″ DualSport SC Suspension provides an even more significant upgrade to capability and ride quality. Combined with the 37″ tires, it now allows the Wrangler to climb or crawl over the toughest boulders, stumps, roots, or any other natural obstacles that are found out on the off-road trails. The best part about the AEV suspension lift kit is that it doesn’t hinder the Wrangler’s on-road performance. So if you need to hop on the highway after you’re done rock-climbing, you don’t have to worry about an unsophisticated ride back home. Which means the days of having an off-road rig and an on-road one are over. With the AEV packages, the Wrangler is capable of filling both roles perfectly. Will the gas mileage still suffer? It’s only natural that it does, but if you are looking at an off-road Jeep, chances are you don’t care much about gas mileage. The main point to take away from this is that the DualSport suspension (on both the JK250 and 350 packages) kit is able to negate the need for a second vehicle. So, all the money you’d spend on a second car for driving on the road, you can put towards gas and more mods. After all, that’s what the DualSport suspension was built for. It’s supposed to provide you with high-end performance both on and off-the road – smooth, controlled, and unhindered ride quality, regardless if you are on the highway, main street, or back road. Off the road, you’ll be hard pressed to find something a Wrangler with an AEV JK350 package can’t take on. When climbing over rocks or other debris, the cabin is able to remain relatively flat, thanks to the superior articulation the 2.5″ DualSport suspension kit provides. In fact, you might find yourself in shock when you look back at how easily you traversed the terrain. Other than having a DualSport suspension that is capable of handling the toughest obstacles off-road while also providing smooth highway travel, there are a couple of other reasons to get an AEV Jeep. At dealerships like Keene CDJR, AEV Jeeps can be outfitted with extra gear depending on the type of specialized experience you need it for. Water tanks, winches, roof racks, and extra fuel tanks are only a handful of the customizable options available. These can make your life easier depending on where you are going off-roading. Or, it can even make your job easier. Maybe you are a forester and have to inspect where a site was cleared of trees, where stumps and roots send lesser vehicles to their grave. But, you don’t want to be swapping back and forth between an on-road and an off-road vehicle. That’s where a vehicle like an AEV Wrangler comes in. Tough as nails, capable, but still drives easily on the highway – the best of both worlds. Not to mention, it’s both smaller and nimbler than a truck or SUV, which means the maneuverability in the woods is far superior. Maybe you are just getting into off-roading, and need a rig that’s reliable, built by experts, and ready to go. Keene CDJR has plenty of pre-modded AEV Jeeps that are ready to tackle any type of off-road environment, all at the turn of a key. That way, you don’t have to worry about installing or fixing modified parts yourself, and can experience instant off-road action. 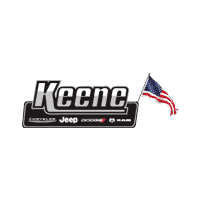 At Keene CDJR, we fully back our AEV Jeeps. Why? Because we know firsthand what a legendary machine like the Wrangler is capable of when it’s paired to some of the best off-roading equipment that AEV has to offer. In fact, we are the sole provider of AEV equipment throughout New Hampshire, Connecticut, Vermont – in fact, all of New England. It’s through these high-quality Wrangler models that AEV has been able to satisfy the needs of performance enthusiasts for nearly two decades, and how we are able to continuously fulfill our chief mission: to be the automotive home of Jeep enthusiasts throughout Keene, NH. We don’t just sell AEV Jeeps, but we also service, maintain, build, and repair them. That’s because our service department is home to our expert Jeep technicians, who know the ins and outs of modding and general Jeep maintenance – especially for those off-roading rigs. Whether you buy a pre-modded AEV model from us or have one built to order, everything is handled in-house. If you’re a beginner and hesitant to get into the off-road scene because you are unsure of where to start, don’t worry – we’ve got you covered. When you place your order or buy or build one of our AEV modded Wranglers, we will be with you every step of the way. We love to take new Jeepers out on a trail and show you what your AEV Wrangler can do, or out to our articulation course (located behind the dealership) so you can get a full understanding of how the flex in the suspension works to keep the cabin level. With our knowledge, experience, and willingness to help, combined with our top-notch AEV models, you’ll be ready to hit the trails in no time!